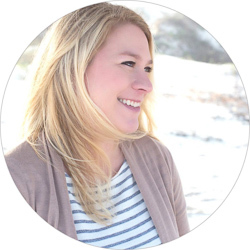 Welcome to the first of a week chock FULL of giveaways celebrating my one-year blogiversary!! 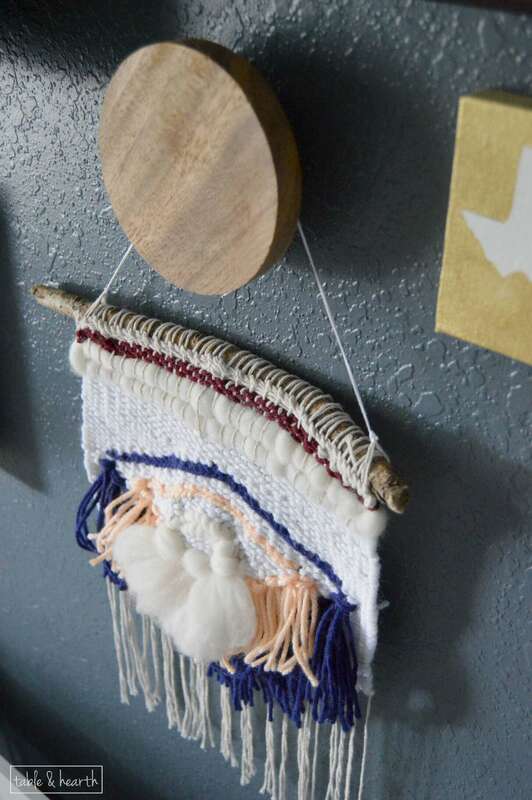 Now, for today’s giveaway, I have my sweet friend Lindsey of Hello Hydrangea giving away one of her beautiful handmade weavings! 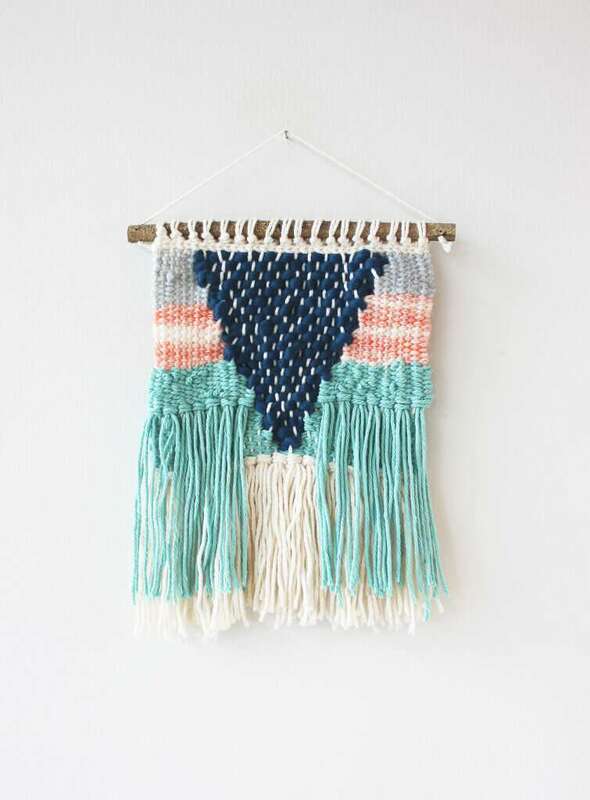 I fell in love with her work when I saw this piece that she made for the uber-awesome Mandi at Vintage Revivals. 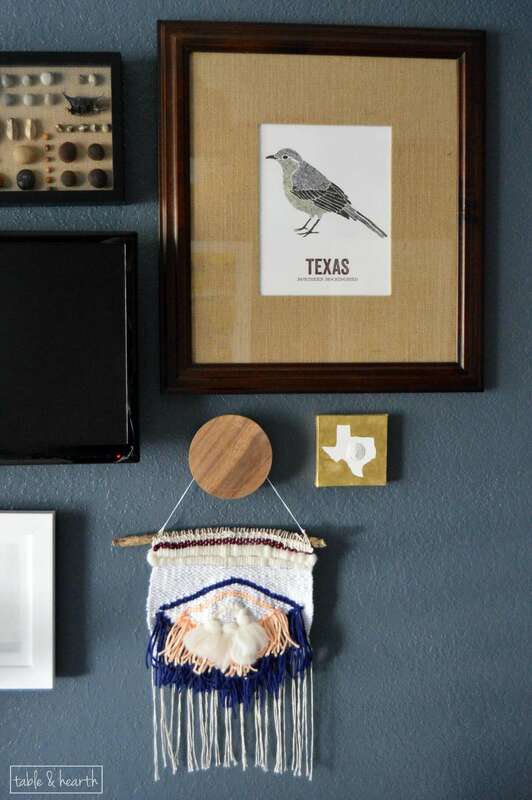 I just knew I had to have one for our new little gallery wall in the office and ordered myself one right away. 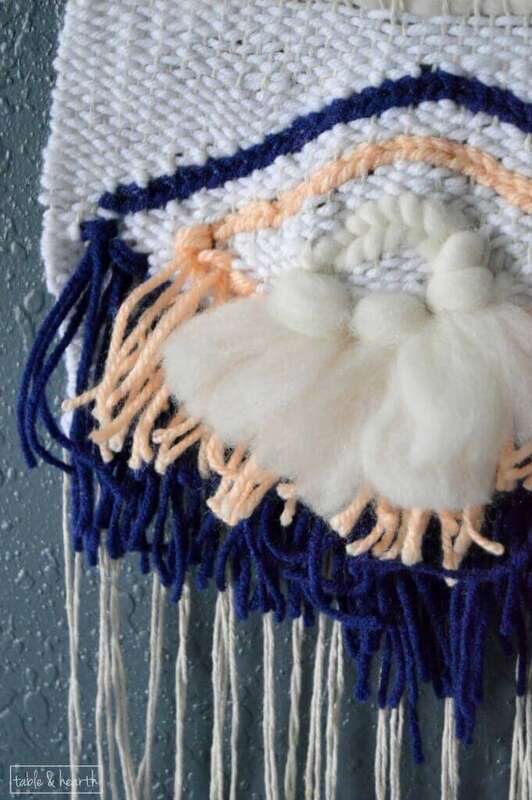 I picked out this lovely little peach, navy, and white guy with a poofy “beard” and it was perfect for this wall. *hint, you’ll see some of these other pieces later this week! Beautiful, right?! 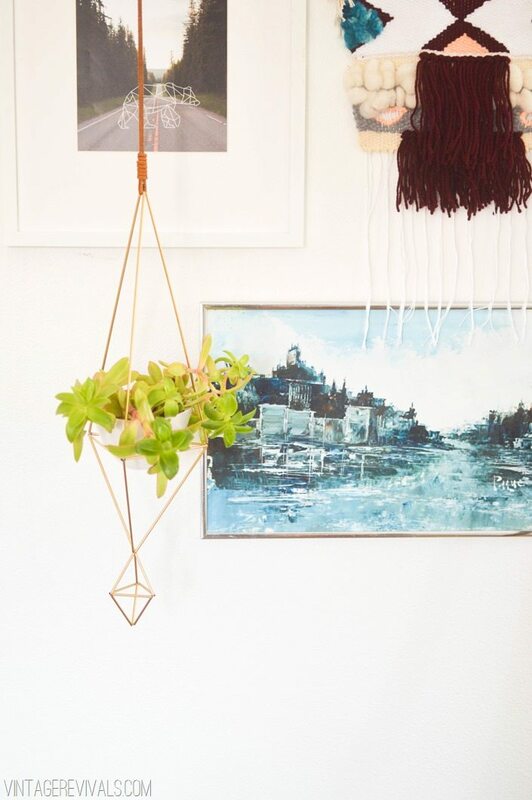 To see more of her amazing pieces and her inspiration and process, oh, and her husband’s beautiful wood-turned bowls, check out her website, Etsy shop, and her blog here. 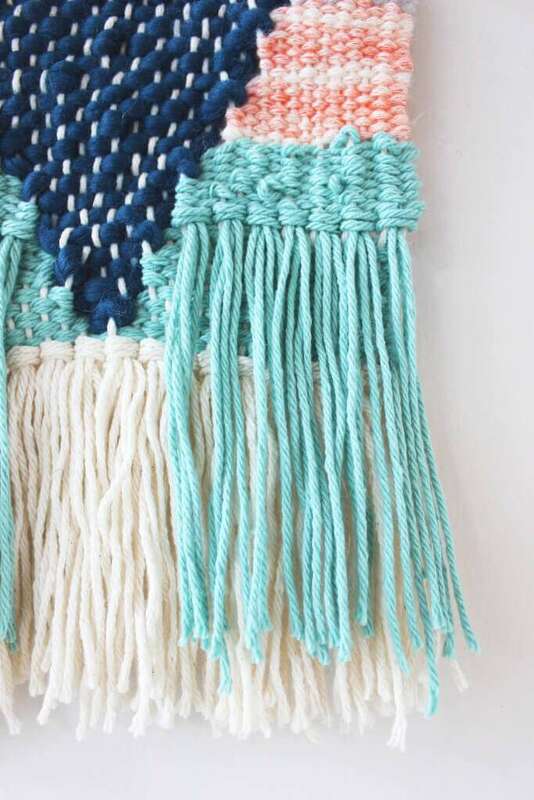 Here’s your chance to win your own weaving! 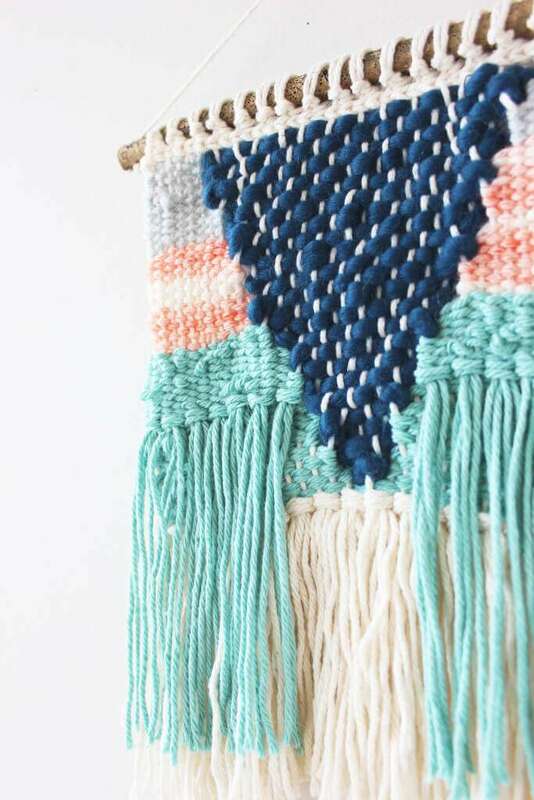 One lucky winner will receive Lindsey’s “Mermaid”, a 9×11″ weave featuring a navy triangle over gray and peach with fun turquoise and ivory tassels. This giveaway is open for one week and is open to both US and Canada residents! Read through the rules below and enter via the Rafflecopter below. Good luck and see you tomorrow for the next giveaway!! 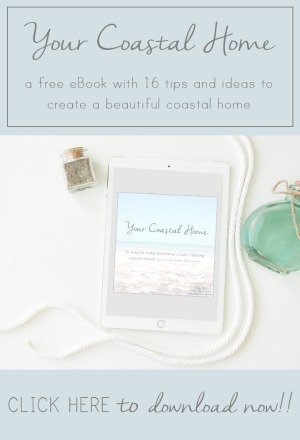 Giveaway Rules: The giveaway has been sponsored by Hello Hydrangea and hosted by Table & Hearth. No purchase necessary. Giveaway ends at 05:00 AM CST on March 30, 2015. All entrants must provide a valid e-mail address and be 18 years old to be eligible. This giveaway is open to residents of the United States and Canada only. One lucky winner will be randomly chosen from among the entrants within 48 hours and notified via e-mail. The winner has 48 hours to respond via e-mail to claim the prize or another winner will be selected. The weaving will be packaged and mailed by Hello Hydrangea directly to the winner. Family members of Table & Hearth or Hello Hydrangea are not eligible to enter. Odds of winning depend on the number of entrants. Please read the complete terms and conditions on the Rafflecopter form. If you have any questions, please contact me at tableandhearthblog (at) gmail (dot) com before entering the giveaway. VOID WHERE PROHIBITED BY LAW. So cute! I love this! 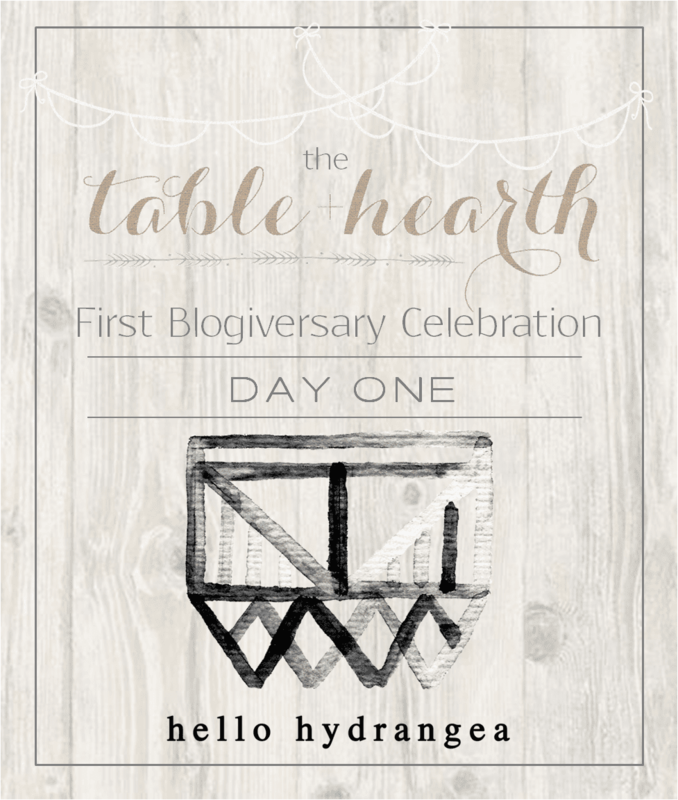 Happy bloggiversary! I love the colors! 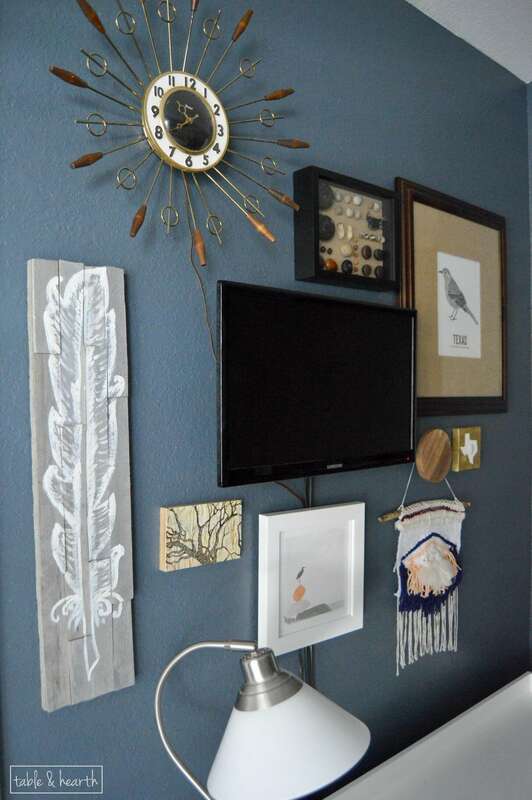 Such a cool piece to add to a gallery wall! They are PERFECT for a gallery wall :) Thank you Ashley!! What a great giveaway! It would go perfectly in my bedroom. Congrats on one year of blogging! Ahh these colors are perfection!! Keeping my fingers crossed! Gorg! Fingers crossed. Those colors are divine. Happy blogiversary love, it’s been great getting to “know” you this past year. All of hers are so gorgeous, it’s hard to choose :) Thanks for being here Dana! Ok, first, HAPPY 1 YEAR BLOGIVERSARY!! So exciting! And second, that weave is GORGEOUS. I love the colors!